This has long been a staple dish in my repertoire and I think that I, like many of us, have a weakness for a good meaty pasta sauce. However, bolognese sauce can often turn out mediocre if thrown together in a hurry and without much thought. My philosophy for making a good bolognese rests on two principles. One: it should be really meaty, and two: it should simmer gently for a long time to tenderise the meat. My usual bolognese contains beef mince, pork mince, bacon, and pork sausage meat. This gives a nice combination of meaty flavours. It’s nice to vary things though, and I sometimes combine the beef mince with lamb or venison mince. Another thing about my bolognese, which is slightly controversial, is that I omit tomatoes and only include tomato purée. The main liquid component of the sauce instead comes from beef or pork stock, which promotes a richer meat flavour. 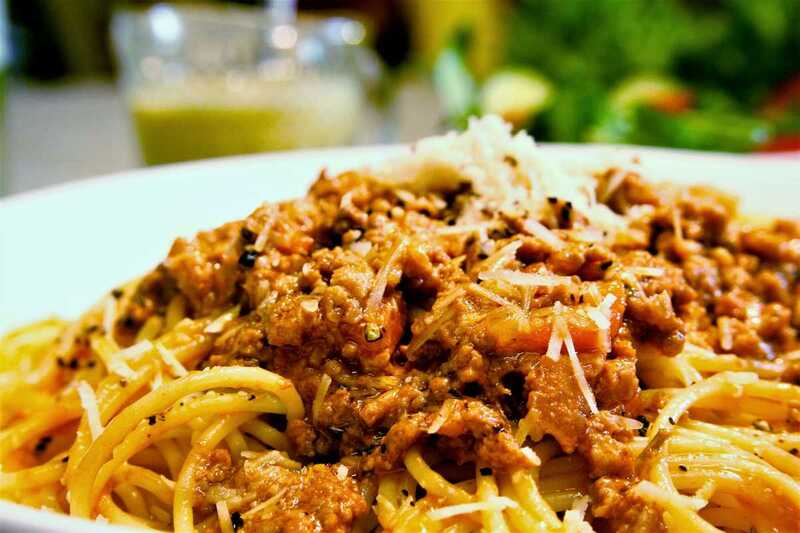 This is an easy reliable meal, and a great one to serve if you have guests since just about everyone likes spaghetti bolognese! I usually make a big quantity, then freeze most of it before adding the cream. Chop the bacon into small lardons and fry in a couple of tablespoons of oil in a large saucepan. Meanwhile, peel and finely dice onions, garlic and celery. Add to pan with the bacon just as it is starting to colour. Turn the heat down and simmer gently for 15-20 minutes, until the onions are soft and translucent. Peel and chop the carrots into small dice and add to the pan. Cook for a further 5 minutes. Now add the rest of the meat and turn the heat up; stir constantly until all the meat is browned and well mixed. Add the tomato purée, wine and stock, along with a good pinch of cracked black pepper, the thyme and bay leaf. Bring to the boil, then leave barely simmering, uncovered, for about 2 hours, or until the mince is very tender and the sauce is intense and rich. If need be, add more stock if the sauce is looking too dry. Taste, and season. Just before serving, stir in the double cream. Serve with grated Parmesan cheese and a nice big fresh salad.